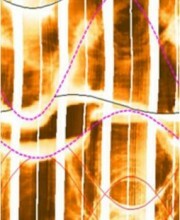 A Borehole Image (BHI) interpretation with special focus on detailed structural analysis provides a comprehensive understanding of brittle and ductile deformation in the vicinity of the wellbore. Especially in complex geological environments, the profound understanding of structural features is indispensible for successful hydrocarbon exploration and development. For a detailed description of the services we offer please click here. Fault and fracture dip picks are analysed to gain an understanding of the subsurface fracture network, it’s constituent fracture types, their orientations, spacings and effect on flow. Fracture aperture and fracture permeability may also be estimated in some cases. The present day in-situ stress field may be evaluated from the occurrence and orientation of diagnostic features seen in borehole images (borehole breakout and drilling-induced tension fractures).